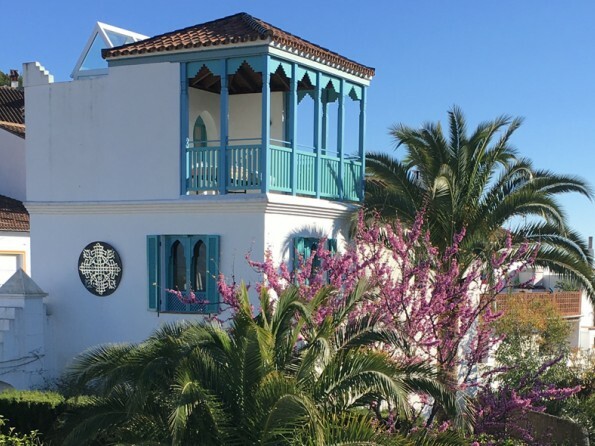 Enchanting Moorish-Style tower house with wonderful views, exotic garden & large pool in the centre of Gaucín, one of the celebrated white villages of Andalucia123.0000Minimum stay 4 nights22nd - 29th July 10% off. 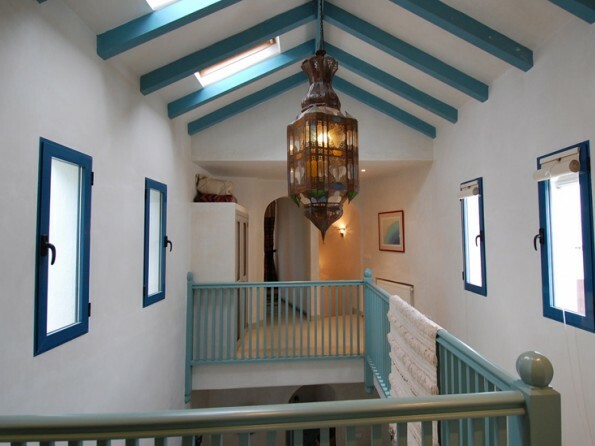 Enjoy the annual traditional Flamenco weekend in Gaucin and the special offer for 2 in Casita Mosaica. Usually £870 per week, now £783. 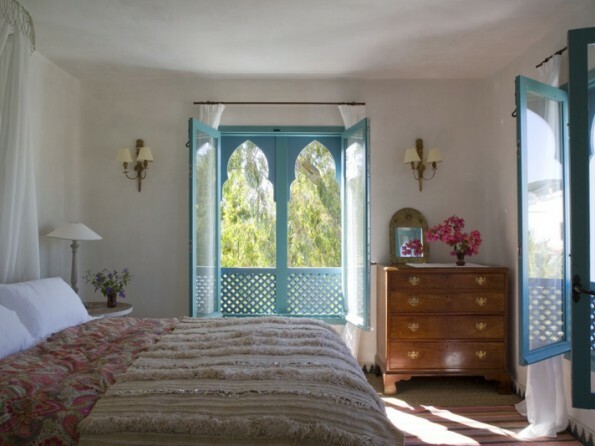 Set in the vibrant and romantic hilltop village of Gaucin, Casita Mosaica is a romantic hideaway for two within a suprisingly large, stunning and very unusual Moorish-style property. Come and enjoy peaceful, stylish surroundings, a simple lifestyle and incredible views. Gaucín is one of the famous ‘pueblos blancos’ of Andalucia, a pretty, friendly, traditional whitewashed village where donkeys still work and many local festivities at various times of the year are enthusiastically celebrated. 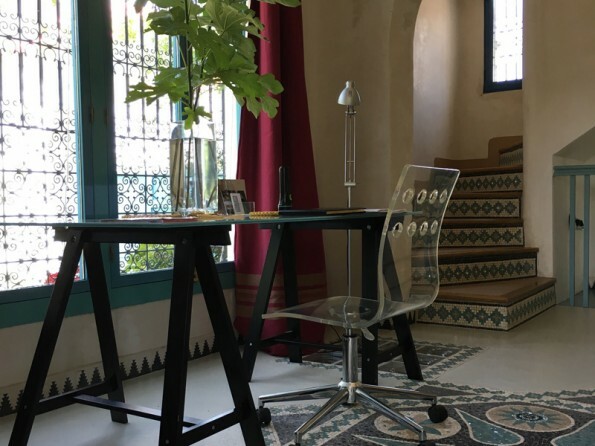 And in its midst, perfectly placed yet hidden privately behind an anonymous façade, is “Casita Mosaica”, a stunningly luxurious space for 2, a romantic tower house which was architecturally inspired by it’s designer owner, from a building in the Kasbah of Tangier, Morocco. 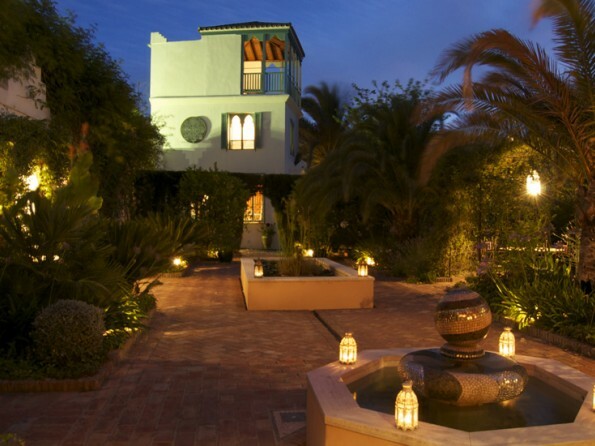 As you would expect from it’s name, the Casita Mosaica is filled throughout with beautiful hand-made mosaics, not to mention antique furniture, Moroccan rugs and lanterns. 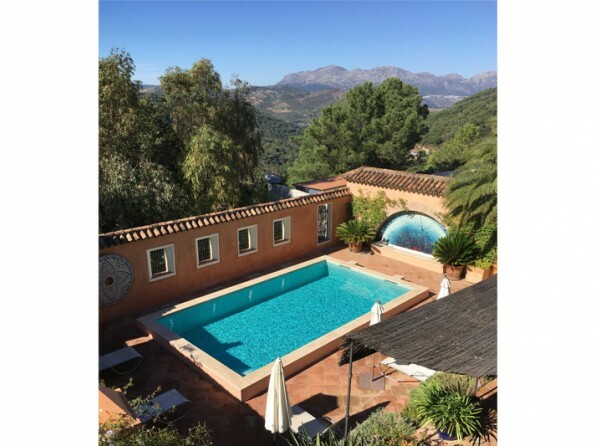 It boasts stunning views towards Cortes de la Frontera and the Sierra in one direction and the tiled roofs of Gaucin in the other from the delightful top terrace (see reviews). This is a truly magical spot. The house is situated on the Ronda side of this stunning village with easy parking outside the house. The many shops, excellent restaurants and charming tapas bars are within easy walking distance. 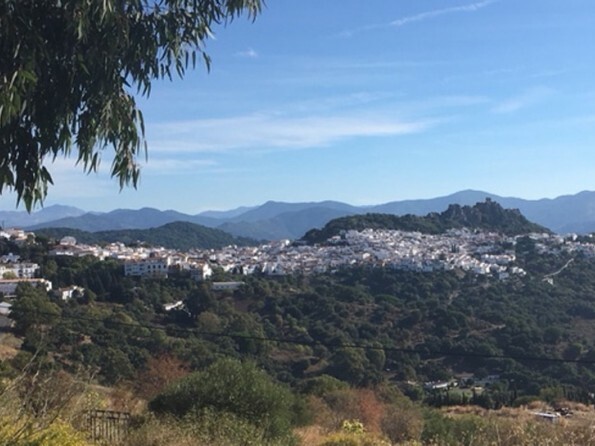 Gaucín is one of the most spectacularly beautiful mountain villages of Andalucia, characterised by white houses, craggy peaks, vultures and eagles overhead and miles of sun dried hills. To the north are the weathered limestone formations of the Serrania de Ronda, and to the south you can see across the Rio Genal valley to Gibraltar and across the Straights into the Rif Mountains of Morocco, North Africa. Once a major Roman settlement, Gaucín has a fascinating history, and nowadays it is a sanctuary for artists, botanists, bird watchers, hikers and horse riders and holiday makers alike. It is only 29Km from the coast and it’s many beaches, there are several National Parks nearby, including "Los Alcornocales", the largest and oldest cork forest in Europe, and there are lots of wonderful towns and cities to visit, from Ronda and Jerez, to Sevilla and Granada. There is plenty to keep energetic guests occupied in Gaucín apart from the wonderful local hiking; a high spec fully equipped gym with personal trainer, padel and tennis courts, pilates classes and a walkers club. 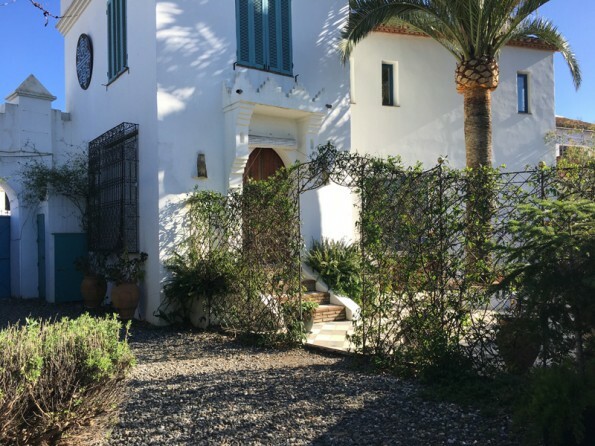 Art Classes can be arranged with some of the local artists as well as private cooking, yoga, massage, manicures and pedicures available in the Casita, even the coastal city of Tangier, Morocco, is accessible for a day trip. The house is 153km from Malaga and its international airport. Gibraltar is also not far away. 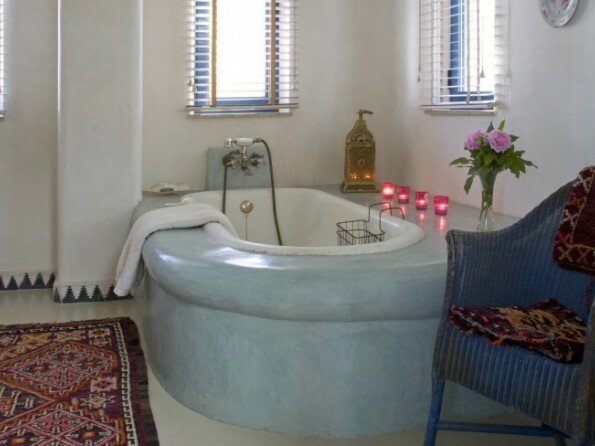 The Casita is remarkably spacious, while made just for two, with a king size bed and a sunny bathroom including both a shower and a bath, (all bed linens, towels and swimming towels are included). The entrance hall has a stunning mosaic floor and opens into a wonderfully bright double height open plan kitchen, dining-room and comfortable sitting-room area with central heating and a wood-burning stove for the cooler months, fast wireless connection, TV with some European channels, audio speakers, a DVD player and a selection of DVDs and novels to borrow. 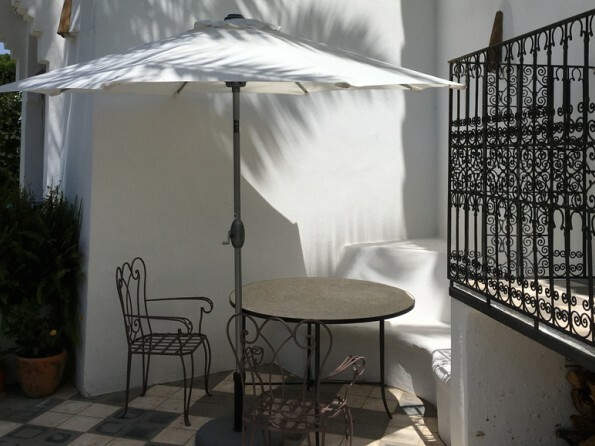 Sliding doors open to the shady patio for outdoor eating, or you can take your drinks out into the garden where there is another table under the pergola and enjoy the Islamic-style garden with it’s fish pond and fountains. The walls of La Casita Mosaica are abundant with local artists` work and a fully detailed house book with all the insider knowledge you need to get the most out of the area is provided. Also Included in the price, is wood for the fire and central heating morning and evening in the cooler months and 2 week booking includes a full change of linens as well as a quick kitchen and bathroom clean. There is a dishwasher in the kitchen and a washing machine for guests use, the pool, garden and patios will be kept regularly swept. Kevin and Geoffrey are the 2 house cats on the property who are very friendly and sometimes like to come and say hello, which might make it unsuitable for anyone with a severe cat allergy. 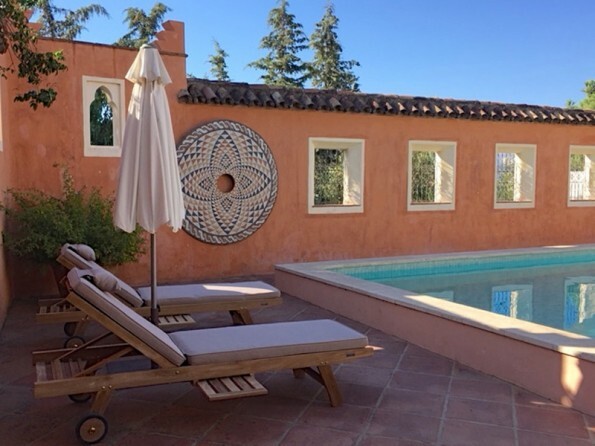 Both La Casita and Casa Mosaica Apartment may be rented together as a large private villa accommodating up to 7 guests and a baby, please enquire for further details. 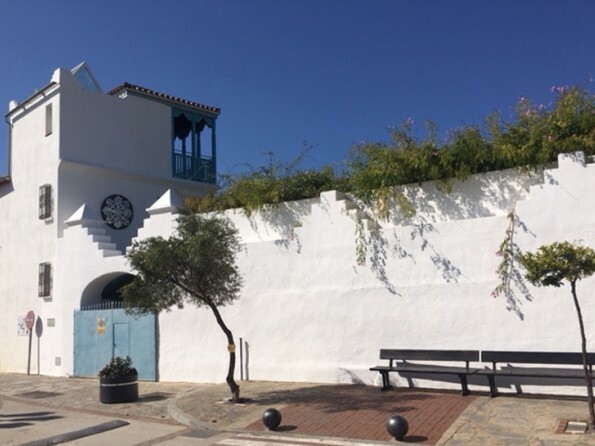 The Casita has its own entrance from the street, a private patio garden with table, chairs and sunbeds under a most exotic palm tree as well as the stunning terrace at the very top of the tower which has a comfortable day bed, a small kitchen, drinks fridge and stunning views. 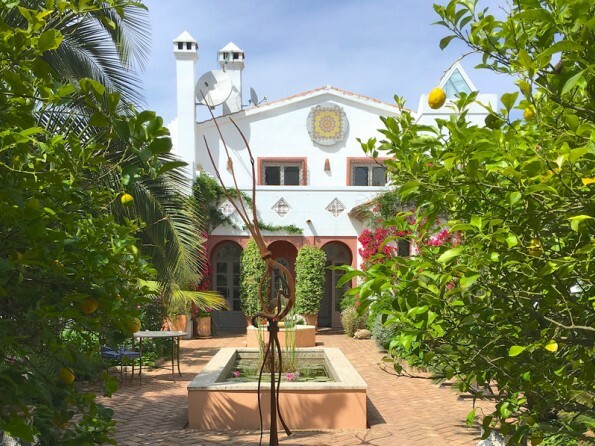 The large scented garden, shared with the ground floor apartment, is full of exotic palms, jasmines, bougainvilleas, mosaics and fountains, and the swimming pool, set within its own courtyard 20 yards from the Casita, is perfection after a hot, dusty day. 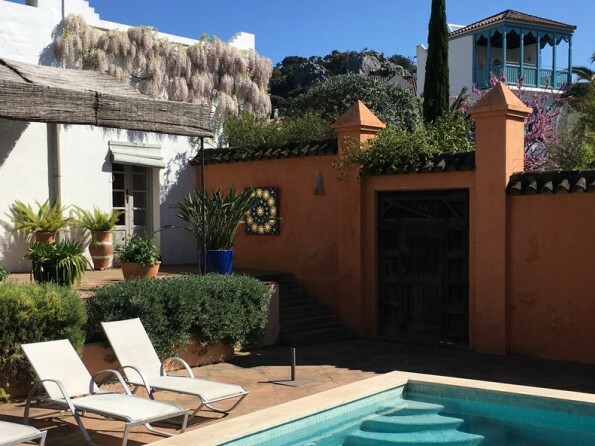 Please note that the swimming pool is shared with guests from the two bedroom apartment Mosaica which is part of the Casa on site, 2 sunbeds and a parasol are kept apart for Casita guests. Deposit of 30% on booking. Balance due 6 weeks before arrival. 2018 bookings begin in March. Friday change over day in high season and fairly flexible in low season, please enquire. 2pm arrival, 10am departure. Longer lets are also be available, especially out of season at reasonable rates please enquire.